Monday morning I took public transit to the county courthouse in a sad part of downtown Atlanta. I was starkly reminded of my white suburban privilege. As I waited with several hundred jurors we were told that there were a number of trials on the docket that day and that many of us would be required to serve. I started to get curious about the experience. After all, didn’t both the promo video and pleasant jury administrator say that in a democratic society, it was our responsibility as citizens to serve on a jury of our peers? My spouse, Bill had served on a murder trial several years ago in this same county and was greatly affected by the experience. I mulled all this over and was simultaneously intrigued and nervous about the potential of serving. Surprise. My number was called for the final juror pool. I never realized that the three days I spent serving as a juror would prove to be so enlightening and disturbing at the same time. I learned that all of us involved in deciding the fate of the defendant had roles to play and during the trial, we were expected to play our parts. It was only after the experience ended did this become clear to me. The three-day trial was held to decide if a young man was guilty of aggravated assault with a deadly weapon. There was a great deal of evidence for us to consider and multiple witnesses. My eyes were opened as I learned about the way the wheels turn in the courtroom, the role of gang violence, drug busts and the complex challenges law enforcement faces in crimes like this. I listened intently and absorbed the body language of the witnesses and other players during every minute I was in the courtroom. We were instructed many times by the judge to not discuss the case, and this extrovert felt the fatigue of keeping my conflicting theories and reactions inside without having a chance to verbalize them. The Defendant – He was dressed up in a new suit, looked focused and took constant notes. Was he told to do that by his defense attorneys in order to show he was paying attention? The Judge – She was SERIOUS and a woman who meant business. She chastised both the prosecuting and defense attorneys equally and would let us jurors use only pencils to take notes because the clicking noise of pens was “distracting.” Her demeanor showed that she owned that courtroom. The Defense Attorney – She had a flair for the dramatic, wore stilettos and went after witnesses coolly and intently. The D.A. – A laid back southern gentleman with a folksy, conversational style. He slowly and methodically presented his case. The Jury – Our foreperson was a gregarious, retired school principal who led us in a memory name game on our first morning. From the start, we all seemed to bond pretty well. We went from banter in the jury room to somber, silent walks into the jury box. After two days, the closing arguments ended and we entered deliberation. Everyone on the jury had their chance to be heard. We were instructed to make absolutely sure that, any guilty decision was based on the evidence and that we found the defendant guilty, it was beyond a reasonable doubt. This was a huge responsibility and we wanted to be as certain as possible that we made the right decision. We unanimously came in with a guilty verdict. Here is what happened. After the verdict was announced, the judge told us that she and the attorneys would be visiting us in the jury room. They wanted to learn how we had made our decision and what had influenced our thinking. What evidence did we weigh? They said they found feedback helpful. And so they appeared. The mood shifted dramatically from the courtroom. The prosecuting and defense attorneys no longer glared intensely at each other. They were actually laughing as they debriefed some of their interactions and moments in the trial. The judge’s demeanor shifted and she was smiling. She explained that she acts “stone-faced” up on the bench because smiles could be interpreted as favoritism for one side or another. And because she is one of the few black females in her position, she believes she is held to a higher standard. The judge also got in some opinions about SEC football. Actually, this switch in behavior makes perfect sense. We ALL have to play roles according to the situation. In most work scenarios we must adapt to the culture and people as the scene changes. Consider if the DA and attorney started kidding each other the way we saw them do in our post-trial meeting. I am pretty sure the jurors would have been confused and, if a mistrial wasn’t called, it certainly would have impacted our decisions. Or, what would have transpired if the judge had shared her strong opinions about women and football, especially with Georgia Bulldogs fans in the jury box!. Impartiality would have gone out the window. We do have to adapt and hide some of our true selves if that serves the scenario. Read Unless You’re Oprah Be Yourself Is Terrible Advice by author and professor Adam Grant for research that supports this view. 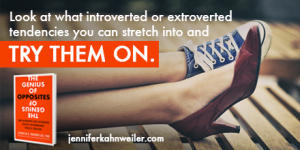 In my coaching work, introverts ask me why they need to be more visible and vocal. And extroverts ask why the need to slow down and be quiet. The answer is that those different behaviors can help us achieve results that we couldn’t if we stayed in our comfort zones. We sometimes need to act the part that is called for. For all its flaws, the criminal justice system continues to function. If the many professionals charged with carrying out justice can act the part when the stakes are high then we should take a cue from their playbook and stretch into new behaviors when necessary. And I do hope you get a chance to serve on jury duty. I think you will find it to be an eye-opening, if not transformative experience. This entry was posted in Uncategorized on January 24, 2018 by Jennifer Kahnweiler.